I have been captivated by paper crafts of late. It all started with getting a Silhouette cutting machine for my birthday last fall. That single tool has really sparked a new creative streak and I am enjoying it. New ideas just keep coming. This new design is one that doesn't require the cutting machine, although it is what inspired me and I did use one. The cuts are so simple that an x-acto blade might even be easier than setting up the computer files. 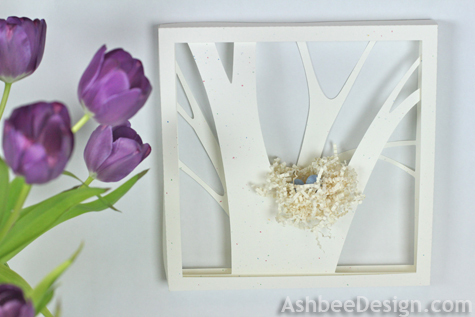 Yesterday I created this new shadow box to welcome in spring. 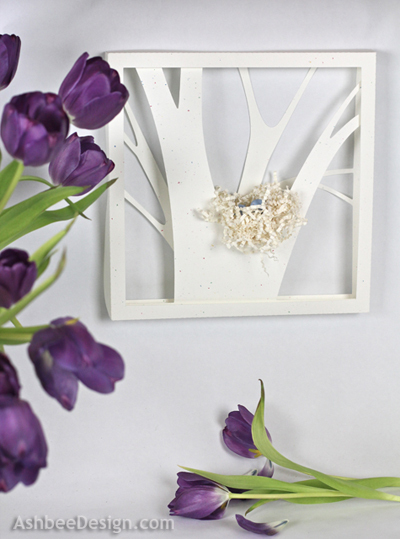 It is a contemporary piece of easy DIY wall art made from card stock and perfect for the season. 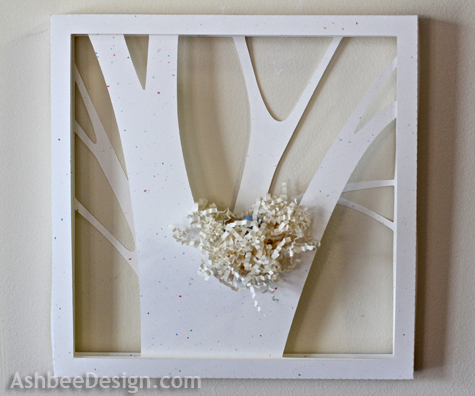 I worked from a similar concept used my Birch Tree Shadow Box but instead worked with only one box made in three layers. The layers include the back branches, the front branches, and a front frame. To that structure I added a tiny bird's nest crafted out of crinkled paper saved from a gift basket. It spans all three layers and adds a three-dimensional element. I purchased a bag of mini Cadbury eggs and saved some robin's egg blue ones. (Those little eggs are incredibly delicious and I have eaten far too many of them since that purchase!) The tiny blue eggs make the design. 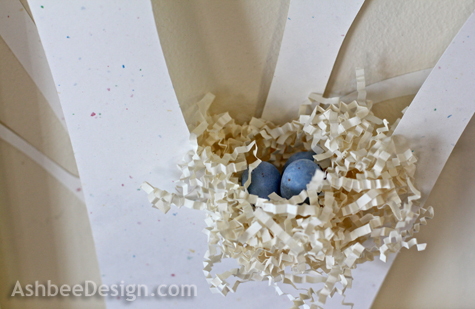 What welcomes spring more than a nest of blue eggs? Although I used a Silhouette it isn't necessary and I will put together a tutorial over the next few days explaining how to make a similar design without the cutting machine so you can try it as well. For now, here are a few more photos. Update!! The tutorial is completed. 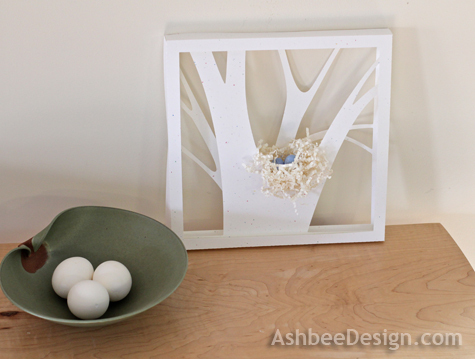 Link through to here to see the easy step-by-step guide on making a Shadow Box like this one. 6/11/2013 Another Update! The Silhouette cutting files for this project are now available online at the Silhouette Online Store here and a tutorial for using the file is here. What a cute idea~ thanks for linking up at It's a Spring thing! I love paper crafts, cutting things out. I don't have a silhouette machine but hope I can make this without one. The chances of me getting one of those babies is pretty remote. SS budgets don't stretch that far, lol. Tutorial is now up on how to complete without the Silhouette.! Follow the link above. Very cute! 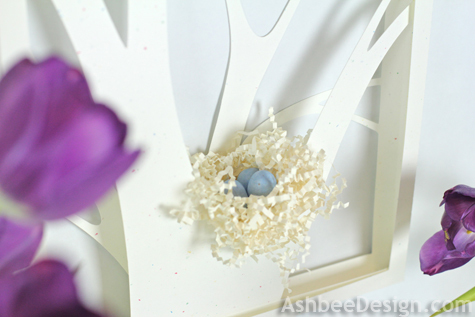 Love the paper cut with the 3d nest! I need to make another papercut, but haven't come up with a good one. This is inspiring! Give it a try, or better yet a variation on the theme. Share pictures when you do! Very cool! I love what you've done here! I have a Silhouette, but I'm afraid that I sometimes don't quite think outside of the box. This is great inspiration! I think the Silhouette is stuck in the realm of letters and rhinestones. I think of it as a machine for 3-D! Thanks for visiting and commenting Tara. That's sweet, I love its simplicity. Going to give this one a try. Thanks for sharing! Very cute. Using the little Cadbury eggs was brilliant. Better not let the grandkids know they are candy though lol!